Onion was a little depressed one day and was complaining to God about having pungent odor and taste, most important of all making beautiful woman cry. Then God replied that he created the tangy red, round plump tomato with all its beauty only to combine with the onion to create a combination of all the tasty gravies around the world. The onion set off to find the tomato…but where is the tomato? He set off to the cupboards and there it was…the juicy, plump, and red tomato. The onion climbed the ridges of the shelf and finally got up to the tomato. The onion blushed and replied… “Well in that case, I will not be mad of being an onion anymore!” I have the cutest companion in the world and why should I? If Tomatoes and oregano make it Italian; Wine and tarragon make it French; Soy sauce makes it Chinese; then onion and tomatoes make it Indian. Here is a recipe with a combination of Onion and tomato. We call it Vengaya Chutney and some call it Milagai Chutney. "What is in a name?" The chutney will still taste the same, even if called by another name! 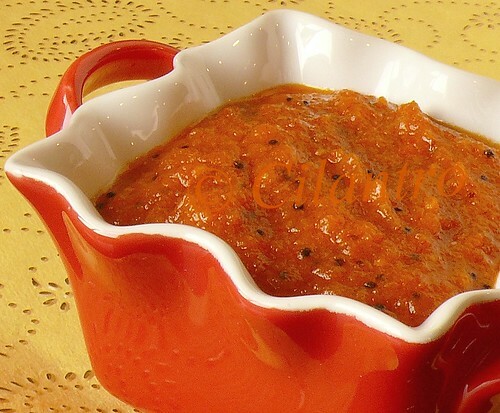 This chutney is my favorite for Idli or Dosai. It is my daughter’s too and hence the story. I think my Amma is best at making it. Thin crispy dosai spread with the chutney tastes great especially when my Amma serves it with all her love and affection. 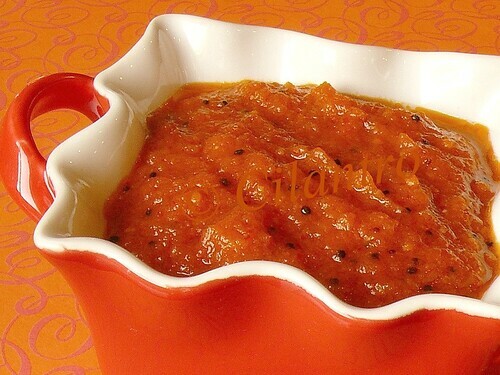 Vengaya Chutney/onion chutney-For Radhika`s JFI event. In a Mixer or Food Processor grind all the ingredients together. Keep aside.In a kadai or pan heat the oil and add the thallipu/seasoning in the order given.To this add the ground mixture.Close the pan with a lid and leave it to simmer for 10 to 15 mts until chutney consistency is reached. Be very careful in opening the lid as the chutney tends to splatter a lot. Serve with Idli or Dosai. Spread a 2 teaspoons of the chutney on the Dosai just before taking out of the Dosai kal/Pan as shown below. i tried this recipe today and it was excellent. the story with the wonderful pictures have come out very well. nice blog spot for good recipes.